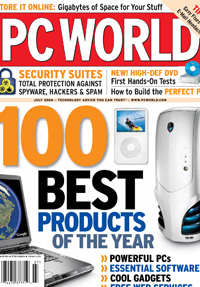 "A machine that will do exactly what it promises to do"
"Like BMW's M Division... with high quality parts, that does its specified job well, fast and reliably"
"An excellent choice of Ultrabook"
"Would I keep using the Zero 14? Absolutely"
Purposely built to be productive, perfectly balanced features, designed to impress and built to work from your first coffee until you turn the lights out and go beyond. To be the thinnest would be to sacrifice certain features, to be built with a purpose would mean to have the perfect balance of everything. 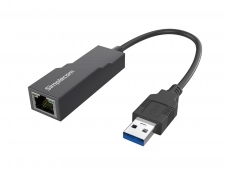 Ensuring all the right ports are available within the perfectly sized portable thin and light computer. A delightful screen, functional keyboard, efficient trackpad wrapped in a beautifully crafted metal housing. All Day Long – Now even longer battery life. To be the lightest for the sake of being the lightest would be to make a compromise on battery life. In order to have an incredible 10-12 hour optimal working battery life with a maximum of 18 hours* battery life would mean to be designed for the purpose of working all day long and beyond. Past 8 hours, the commute to and from, the in between and the afterhours are all part of being all day long. Sustainability and a long service life is paramount in the design of the BlackBook Zero and this is why the battery is serviceable and removable via the accessible bottom plate. 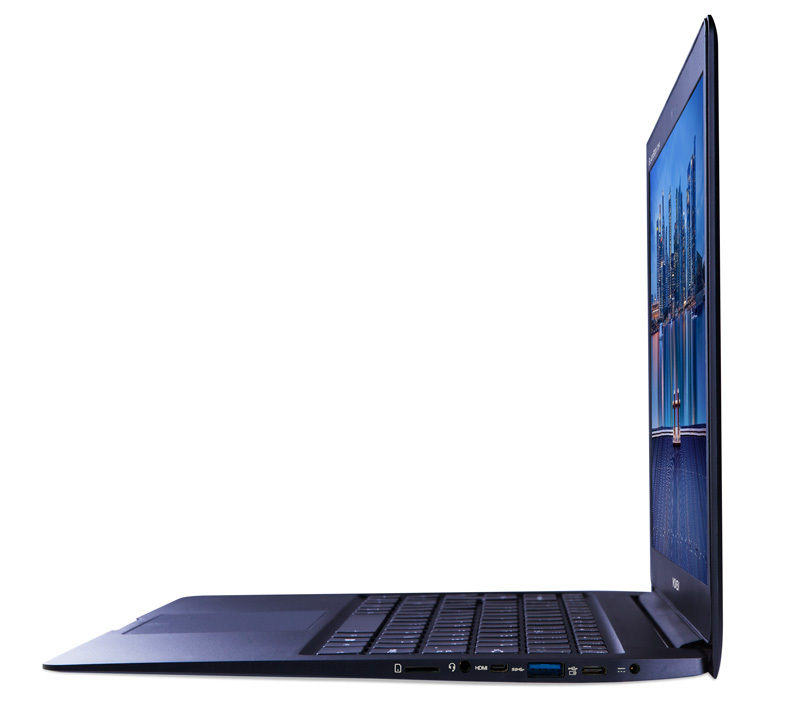 This is the perfectly balanced thin and light Ultrabook, without compromise. If it’s not broke, don’t fix it. The newly designed, precisely backlit keyboard is built on an age proven switch system that provides the perfect key height, with a reassuring soft sound and crisp responsive feel. The BlackBook Zero system design has allowed for the use of a better keyboard that is not too flat in height and has multiple illumination settings. Getting it done all day long on the perfect keyboard is after all what a clamshell notebook computer was originally designed for. Nothing can imitate the feeling of real movement. The downward motion accompanied with a click is both reassuring and certain. 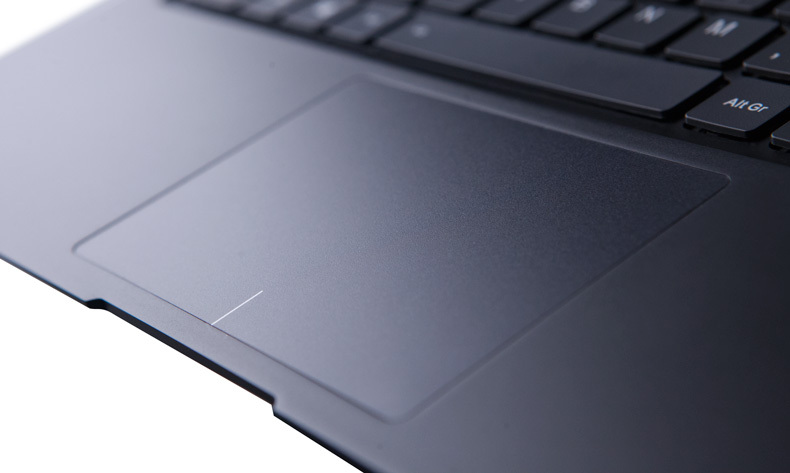 The new perfectly constructed Trackpad in the new BlackBook Zero provides the same familiar downward movement with the correct feedback which is what you’re accustomed to. A non-artificial trackpad you can feel is the extension to your fingertips allowing you to correctly perform certain tasks. All the Ports you need – No Dongles. The BlackBook Zero 14 has all the ports and connectivity options you need for all your devices from the past, for the present as well as for the future. 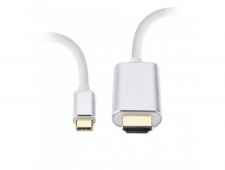 You’re old devices and new devices can now harmoniously work together with the best balance of multiple USB 2.0 and 3.0 ports, type C, micro HDMI, Micro SD and 3.5mm headphone ports. You no longer have to choose either or. 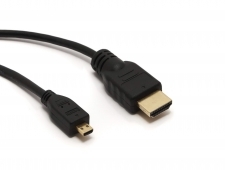 2 X Micro Power Adaptors + 2 X Power cords included as standard, one for home and one for the office. With the added portability, extended battery life and now including two power supplies, you will never run out of power. We realise that your portable computer needs to be used everywhere all the time and we have provided each and every Venom BlackBook Zero 14 with two power adaptors minimising the need to ever have to carry an additional power supply with you. Inside is the all new Intel Core i5 and i7 processor, consuming a mere 4.5 Watts of power while up to 18% faster than its predecessor. The new Gen processor gives a real boost to the graphics engine now with native 4K support, create, convert and use 4K videos in way you never could. You can now transcode a 1 hour 4K video in just 12 minutes. Efficiency with playback is apparent with a 57% boost in battery life with 4K video playback over the 6th Gen processor. Intel's Turbo Boost 2.0 technology is a feature that manages both processor performance and power so that tasks get more processing power when they need it on demand. The all new Hyper-Threading Technology helps the CPU complete tasks faster by delivering two processing threads for each core. 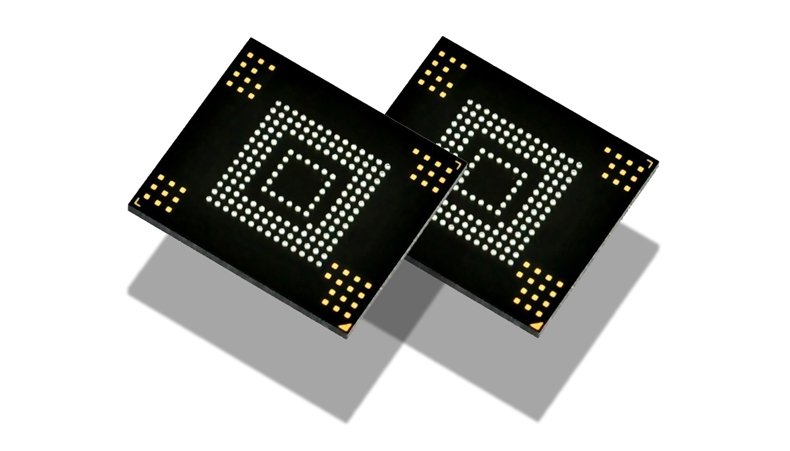 The Core chips also include Speed Shift technology, which allows for the processor to quickly settle on its best operating frequency, thus optimizing performance and efficiency. Short bursts of activity such as browsing the web are now even faster. The age of portable computing has never been better with the new BlackBook Zero 14. 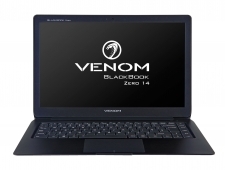 Fanless architecture in the Venom BlackBook Zero 14 is the first BlackBook to be without a fan. 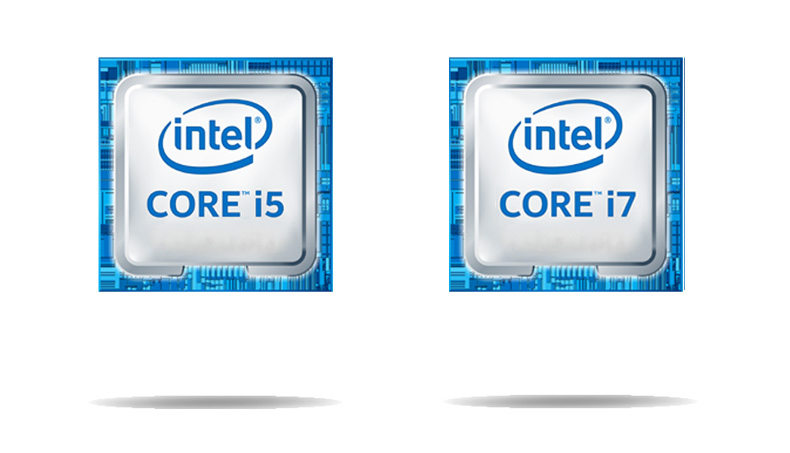 The new Intel Core M processor only draws 4.5 watts of power which consumes up to 10 X less power than other Intel Core CPU’s used in notebooks. This extremely efficient low power consumption means there is less heat generated therefore no fan or heat pipe is required. 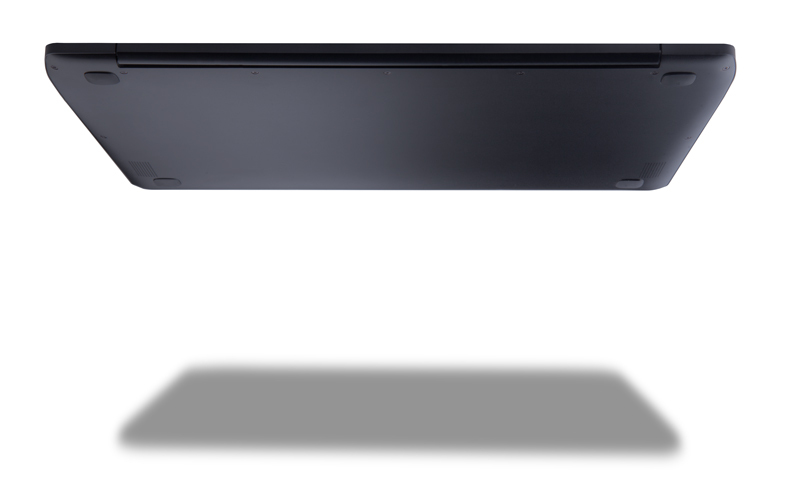 The cooling system works via a passively cooled thermal design that allows for a thinner base height of just 14 mm/.55” at its highest point, in addition to a near silent operation. Now you can enjoy performance in a thin, silent design. 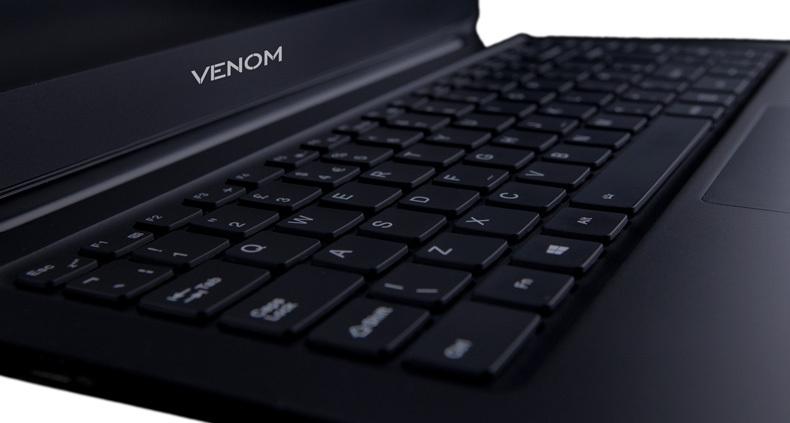 The Venom BlackBook Zero 14 is manufactured from a UniBody, Aluminium metal composite casing wrapped in stealth metallic black. 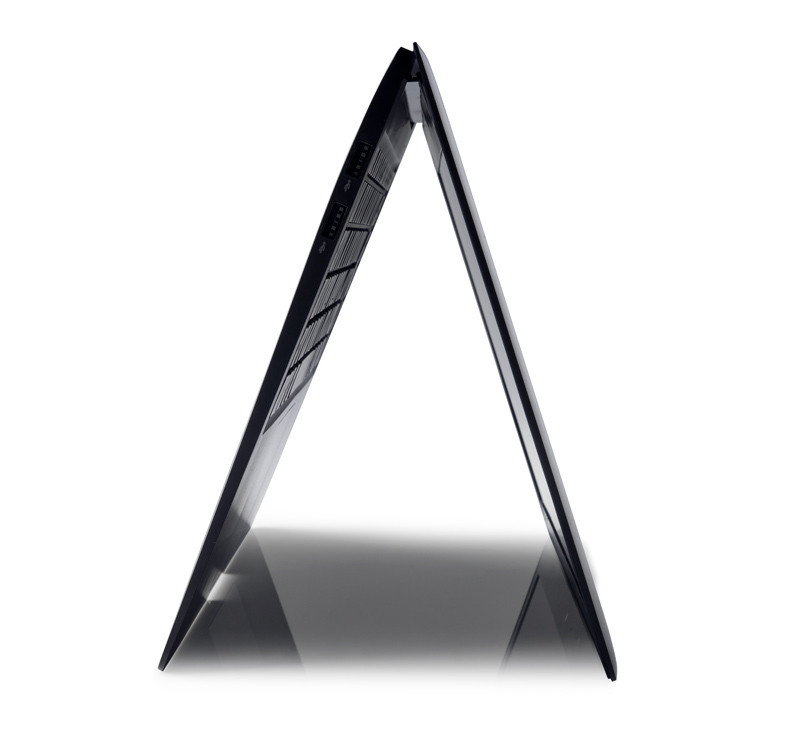 Its heat dissipating properties, artful look and solid reassuring feel are what make the BlackBook Zero 14 what it is. The added light weight yet strong attributes ensure that the mobile warrior is always ready to compute on the go weighing in at just 1.4kgs/3lbs. A thinner, lighter purposeful design also enables for the perfectly sized screen. 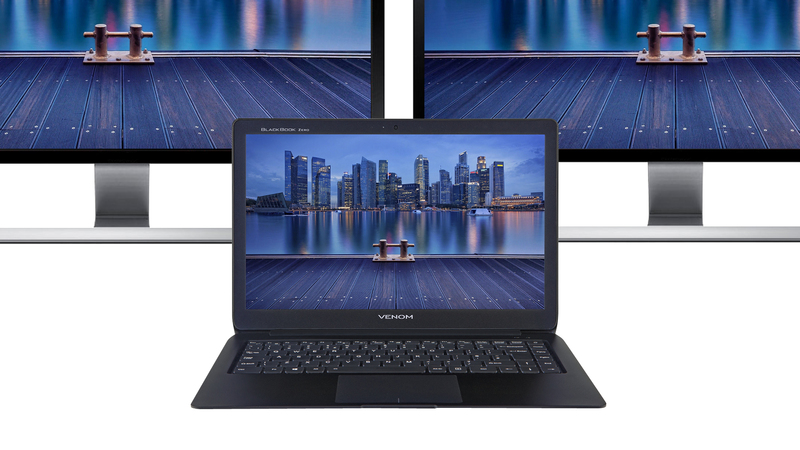 Large screens provide comfort, small screens provide convenience, and the perfect screen size in a thin and light notebook is now a reality at 14.1 inches. Now you can be both mobile and productive. 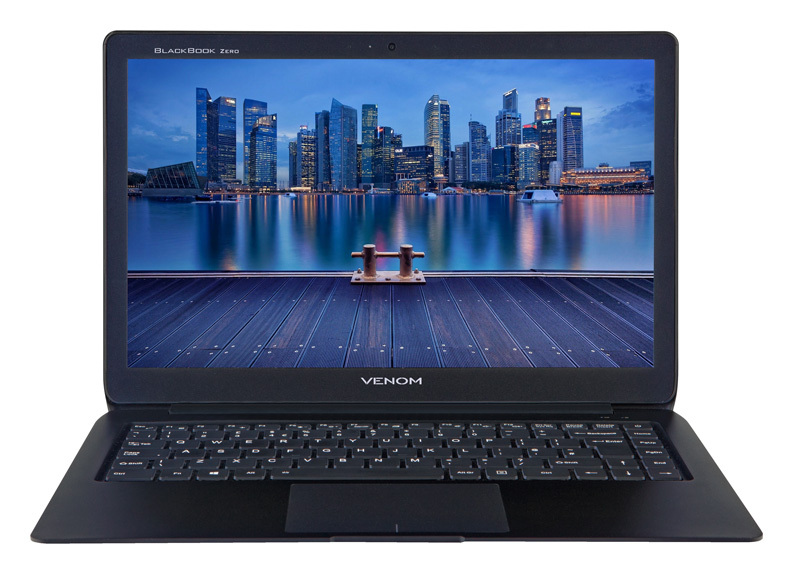 The panel on the Venom BlackBook Zero 14 provides the right colour saturation and vivid contrast in a 1920 X 1080 resolution no reflective screen. The black levels are rich and deep with stunning brightness levels. The active matrix IPS TFT LCD first developed by Hitachi in 1996 has come a long way, now with even wider colour gamut and greater viewing angles provide a much better aesthetic with superior results. The BlackBook Zero 14 has the perfectly calibrated 14.1 inch non reflective IPS screen for high gamut, rich colour contrast, wide viewing angles with the perfect resolution for a portable clamshell notebook. Countless studies have shown that dual monitor setups greatly improve efficiency when it comes to computer usage. Dual monitors on your desk allow you to have critical information displayed on one screen for reference purposes while utilizing the second for your actual work, have a PDF document or website open on one screen and Microsoft Outlook or Word open on the other. The BlackBook Zero 14 will allow you to use two external monitors while still running the third screen on the BlackBook, natively. The BlackBook Zero 14 is designed to work for you both in and out of your office, studio at home or away, wherever you are. 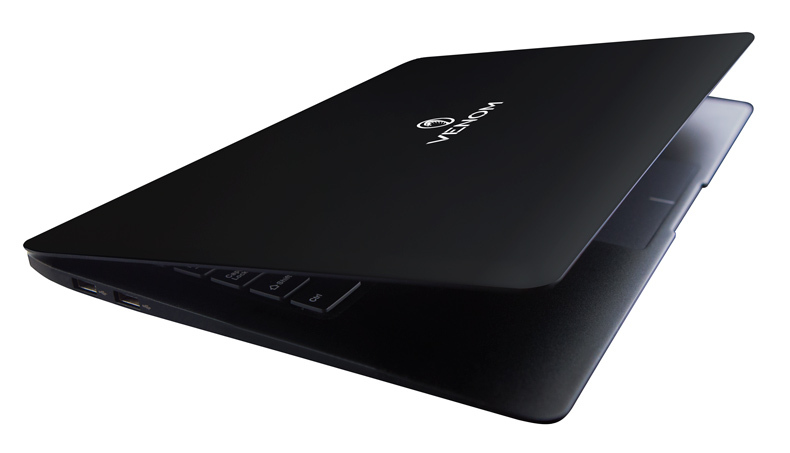 With Intel’s latest 802.11 ac technology the BlackBook Zero has Wi-Fi speeds of up to 867 Mbps and up to 3 X more bandwidth and connectivity. 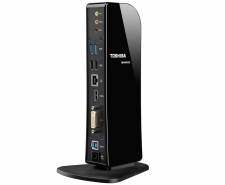 Smoother streaming of higher resolution videos, fewer dropped connections and less congestion while achieving higher speeds away from the router. Connect to the newest low energy Bluetooth products as well as your familiar devices such as headsets, keyboard, mice and more. Solid State Drive (SSD) flash based technology ensures your BlackBook Zero is awake and running in windows from a cold boot in just a few seconds. 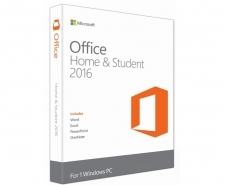 Applications, programs and data are accessed and launched at up to 10 X the speed of other drives. The inbuilt Micro SD Card provides room for inbuilt added expansion for external devices or simply temporary added on the go storage. The BlackBook Zero 14 utilises an upgradeable and replaceable M.2 SSD so you can always upgrade and or recover in the future. The choice is yours. The BlackBook Zero 14 utilizes the latest Low voltage, low energy consuming, high speed thermally efficient memory available. This assists with the design challenges of having a thin and light machine and enables the fanless architectural design within the BlackBook Zero 14. Low Power DRAM (LPDRAM) provides great temperature control and with LPDDR3 the most suitable memory is utilised for the perfect balance between, speed, energy consumption, height restrictions and thermal control. As with any Venom BlackBook, our factory image comes with fully licensed and usable software with no bloatware and all the right tools. Our Windows image is optimised for performance and each and every pre-installed program has been carefully selected, customised and installed for the optimal user experience. 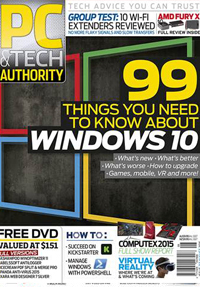 You will not need to spend all that time installing software from when you first turn it on. 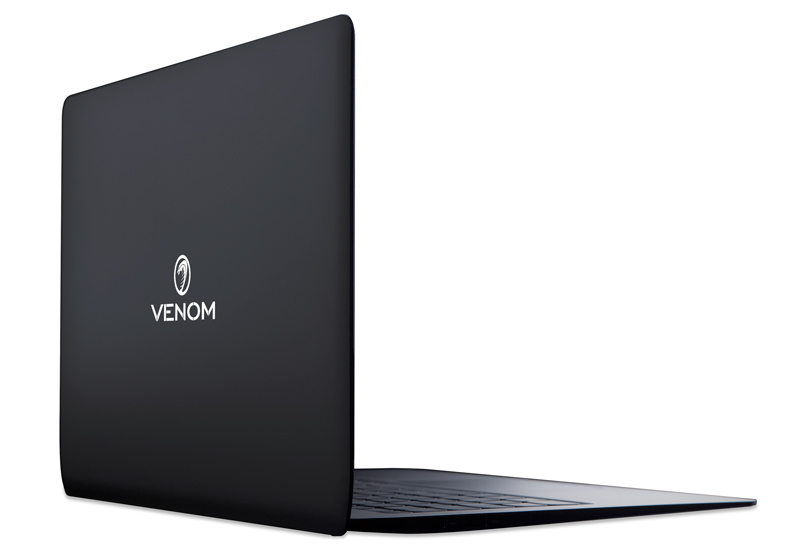 Empowering you is at the heart of Venom, we know you don’t want to have those 6 am recovery sessions, our unique software recovery system means you can be back up and running with the factory settings from the included external recovery drive in less than 12 minutes. We have future proofed our design and our SSD drives are upgradeable and replaceable, so while not limiting your future expansive needs we also realise your recovery partition should not be internally placed but has been conveniently included externally with every BlackBook Zero 14. There is nothing else like the BlackBook Zero 14. Case: Sand Blasted Alloy composite, metal unibody consruction. Audio: High Definition Audio system with 2 X Boom box speakers, Built in 2 X microphone, Audio out for speakers or headphones. Power Supply: 2 X Power adaptors for both Home & Away - AC in 100~240V 50~60Hz, DC output 12V 3A, 36W. Battery: Up to 18 hours with ultra power saving settings or up 12 hours with wireless web and video playback with light use. Up to 9 hours with average use.